You're invited to an evening of “Ted” style presentations by cannabis professionals, networking, and an awesome raffle. Did we mention Tacos? Blunt Talks are “Ted” style presentations given by innovators of the cannabis industry who want to share their knowledge so we can grow together! With the passage of Proposition 64 (legalization of recreational marijuana use), the California cannabis industry is experiencing a period of rapid growth! There are more businesses, brands, products, and services than ever before, and now is your chance to learn from a few that are really changing the game! 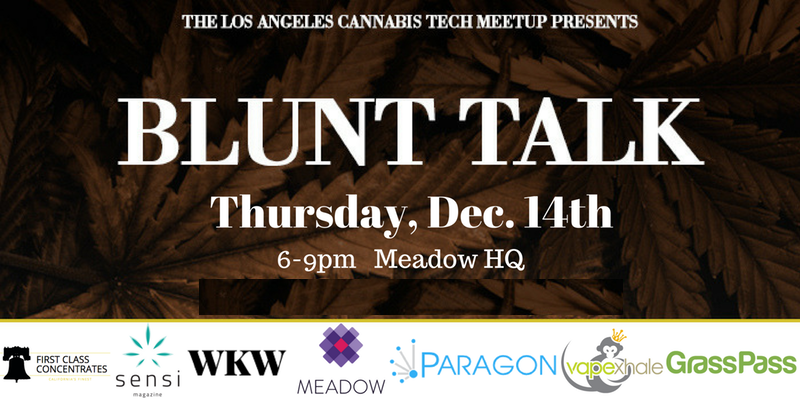 Whether you’re a professional looking to transition careers into the cannabis industry, a canna-professional looking to keep up to date with whats going on, or a business owner that is looking to add talent to your team, this installment of Blunt Talk is for you! FORMAT Eat tacos. Check out our sponsors. Make friends. Hear short, TED-style talks from cannabis professionals. Have a chance to win cool swag. Ask some questions. Win more swag. Speakers: Seibo Shen, CEO of VapeXhale Jimi Devine, Cannabis Industry Writer, Cannabis Now + Greenstate.com Merril Gilbert, co-founder of TraceTrust Partners, Topic – What is an edible dose? David Hua, Co-founder/CEO Holly Alberti, CEO at Healthy Headie Lifestyle + Marketing at Harborside Hosted by: Michael Starr SPECIAL THANKS TO: We Know Weed Meadow Paragon helps talented individuals find their place in the cannabis industry. If you're a business that needs to hire, a professional looking for a new career, or have any questions at all, email team@joinparagon.us GrassPass: The ClassPass of Grass. GrassPass is world’s first cannabis membership app for any budget or lifestyle. Once you're a member, simply choose a dispensary in the app, make a reservation for free cannabis, and go. Canopy is a seed-stage business accelerator program and venture fund for the cannabis industry.